This content is brought to you by Seon. Wireless Video Downloading is fundamental to the overall success of your school bus video surveillance solution. It reduces the risk of not having video when you really need it and saves a school transportation team hours upon hours in manual processing time. A basic wireless system, as we all know, is relatively easy to set up. Most of us enjoy Wi-Fi networks in our own homes, with quite a few of these networks having been completely set up with very little help from wireless experts. A wireless network that can handle the volume of data that is automatically associated with video, as well as provide reliable up-time and superior levels of security is another thing altogether. This type of network requires a level of expertise that very few video surveillance system providers offer. It’s important to note that bringing in wireless networking experts does not necessarily equate to significant amounts of operational downtime, budget drains, or a long lead-time before you hit the ground running. 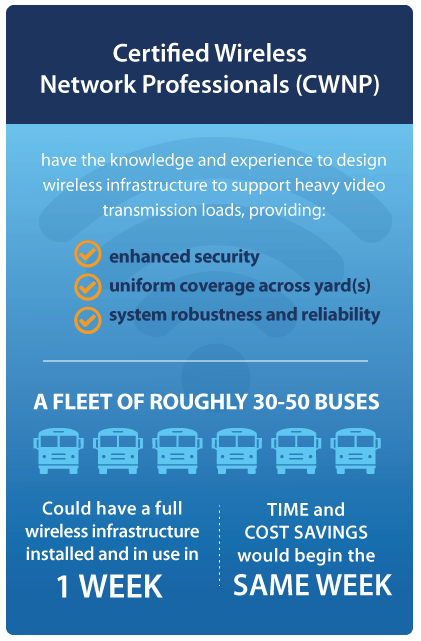 Implementing wireless school bus video downloading (when you’ve entrusted experts to help you design and install your infrastructure) is easier than you think and it can start delivering real tangible value within days of installation. 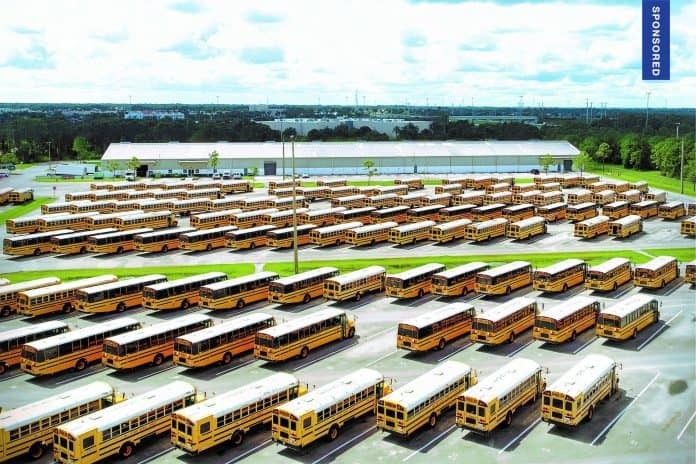 So let’s talk ROI for a fleet with roughly 100 school buses and an average of five video download requests per day. Consider the time it takes to: Source a specific bus, make your way out to the bus, remove the hard drive, bring it back to the office, extract and view the footage in question and return and re-install the hard drive on the bus. That could take anywhere from 30 minutes to well over an hour. Also, factor in an average video retrieval rate of $20/hour. The potential dollar savings, even with this lower video download request threshold, could potentially equate to $3,000 to $4,000 each month. But that’s only part of it. To get an even more accurate idea of the ROI we need to take a step back and look at the reason(s) a fleet implements a video surveillance system. The main reason a school bus operation typically installs video surveillance is to minimize exposure. A bus video surveillance solution enhances the safety of those on or around the bus and helps the fleet avoid false liability claims by providing defendable video evidence for detailed analysis of specific events. 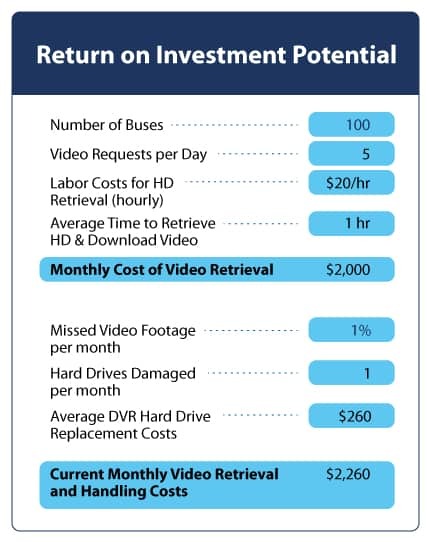 School bus fleet managers and transportation directors get this—they understand the value of a video surveillance system almost intuitively. But many don’t realize that just having a video surveillance system alone is not enough if you aren’t able to guarantee your system is always functioning and always able to provide quick access to the information you need, when you need it most. This is because hard drives can easily go missing. What if a hard drive isn’t returned to the bus? What if a drive is returned to the wrong bus, or it’s installed incorrectly? In these examples, critical footage would not record correctly or at all. Systems can also go offline, and without a physical inspection of each recorder on each bus, there would be no way of knowing that relevant footage was not recording until it’s too late. Wireless downloading software, such as Seon Commander, allows a school transportation team to remotely monitor the health of each of their recorders and take immediate and appropriate action as required—all without leaving their desks. Seon customer St. Lucie Public Schools can speak firsthand to the benefits of wireless downloading. They operate 316 buses in a three-tier system. By implementing wireless downloading, St. Lucie Public Schools completely eliminated the risk of lost or misplaced video or hard drives. When issues arise on a school bus, as soon as that bus returns to the yard, the video in question begins to automatically download. Security staff is able to immediately send that video straight to the school, or whoever needs it. St. Lucie Public Schools also makes use of the Seon wireless software to check on the status of each recorder remotely—they can tell which recorders are offline or require attention directly from the comfort of their desks. And they save their area managers, shop technicians and security staff hours of manual processing. Watch below as Don Carter, director of transportation for St. Lucie Public Schools, talks about his wireless experience. If your transportation department is already using a video surveillance solution, and you’re interested in adding the benefits of wireless downloading, the process of upgrading your system is very straightforward. Discovery, initial planning and designing can be initiated with very little impact to your transportation team. Online mapping tools provide the basic geographic data to get a design started. Certified wireless network professionals will then plan a system that delivers efficient downloading and consistent coverage, taking into consideration yard size, location of trees and the shape and size of the various surrounding structures. Your school transportation team could be enjoying the benefits of wireless in no time at all. If your district or company was originally compelled to increase fleet safety by installing video surveillance, consider that implementation of a wireless downloading network can be quick and efficient. Furthermore, its very function drives the ability to minimize risk, save time and money, and deliver a solid and rapid return on investment. Are you considering an upgrade to your existing video surveillance solution? Or perhaps looking to invest in your very first solution? Watch the full interview with Carter for advice on implementing video in your fleet, real-world results and examples of instances in which video proved to be crucial to his operation. If you need help sourcing a Certified Wireless Network Professional, contact info@seon.com.